Relax in a unique setting, a small corner of paradise in the middle of olive tree fields, vineyards and cypress trees in a beautiful typical Tuscan landscape. 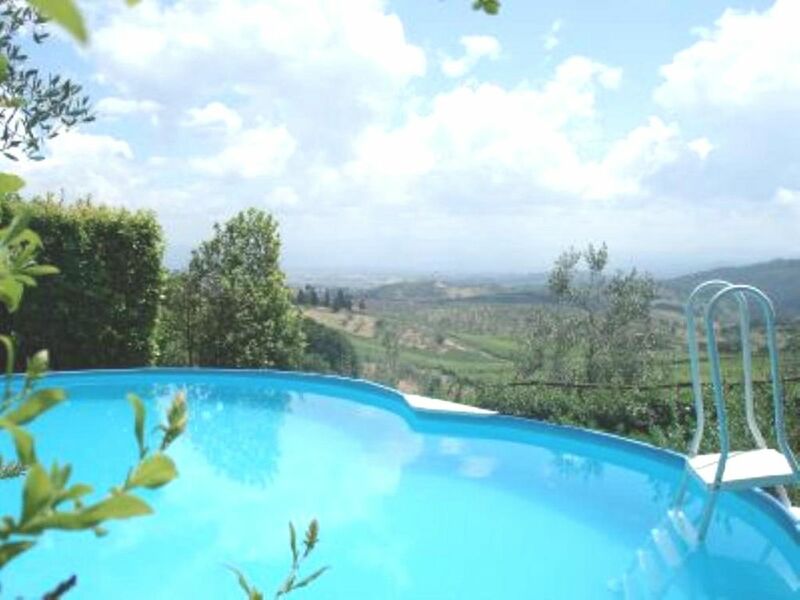 Our villa is well located near a village, 30 minutes driving from Florence, in a beautiful and panoramic location with a fantastic view overlooking Florence. You can eat outside or swim in the pool with views overlooking Florence and the Medician Villa "La Ferdinanda" of Artimino. The outdoor pool is private (4.50 m x 7.50 m x 1.20 m/h) and is to be shared with our family and the guests of the other apartment (max 2 persons). The pool is usually open from end of may until the end of September, depending on the season. You can have access to the pool throughout the day. It is a nice apartment of 60 square meters, located on the ground floor of our villa. The apartment has a private garden and a independent entrance. It is composed of a large bedroom with a double bed, a bright living-room with a well equipped kitchenette and a sofa bed, a bathroom with shower, a store- room. The apartment overlooks the private garden where guests can eat, sunbathe and rest and enjoy a magnificent landscape. The furniture is delicious and comfortable. Digital TV and central heating. There is a safe parking outside the property (50 m). The House is particularly well situated for touring around Florence and in Tuscany and it is therefore the ideal base for exploring the region. It is located 20 km west of Florence, near the villages of Carmignano and Vinci on the hills overlooking Florence. You can reach Florence in 30 minutes by car. You can enjoy the city of Florence without its drawbacks! The nearest airports are Florence "Amerigo Vespucci" in 20 km, Pisa Airport "Galileo Galilei" in 50 km away and Bologna Airport "Guglielmo Marconi to 90 km. Siena, Arezzo, the beaches of Viareggio and Versilia 1 hour driving Vinci 15 min, Prato, Pistoia, Montecatini 30 min. For your purchases the nearest shops are within 2 kms: green grocer’s, pastry’s, bars, banks, a newsagent, stationer, haberdashery, hairdresser, florist, electrician, laundry, post office, pharmacy (with the surgeries), three restaurants, wine bar, pizzeria. There are numerous restaurants around where you can eat really well and drink good wine. If you prefer shopping in a supermarket there are 3 in the nearby village of Poggio a Caiano where you can buy many local delicacies. The House is located just 20 km West from Florence, close to the villages of Carmignano and Vinci in a peaceful hillside landscape. The area is interesting from an archaeological point of view and for its cultural history with the presence of Etruscan tombs and two famous Medici villas at Artimino and Poggio a Caiano nearby. In the Church of San Michele in Carmignano you can admire a famous painting: the "Visitazione" by Pontormo, a famous artist of the Renaissance whose paintings are also in the Uffizi Gallery and in the Louvre. The Museum of Leonardo da Vinci and his birthplace are 15 minutes away by car. The whole area is renowned for the production of wines famous all over the world. For sports lovers in the vicinity you can enjoy tennis, golf, horse riding and trekking. If you like hiking you can make excursions from our house because we are in the hiking trails. Being a rural community a car is necessary transport for convenience. There are also some public buses available connecting to Florence and Prato. Very happy to help with any queries that the guests may have. All the information about Florence and main tourist attractions nearby. We really want you to enjoy our apartment and hope that it meets your requirements. We really want you to enjoy our apartment and hope that it meets your requirements. Whatever your reason for visiting let us try make it the best stay yet! (Text automatically translated) The place is quiet and charming, full of history and art, suitable to spend a holiday of culture and relaxation. There are many places to visit characteristics: the Medici residences in Poggio a Caiano and Artimino, Etruscan tombs Comeana, the Etruscan Museum in Artimino, the church of S. Michael in Carmignano where the famous "Visitation" paintings by Pontormo, the native home and museum of Leonardo da Vinci (Vinci village is only 15 minutes away).Florence is a half-hour trip, Lucca 40 min, 50 min Pisa, Siena and Arezzo and the beaches of Viareggio and Versilia one hour, 15 minutes Vinci, Prato and Pistoia Montecatini 30 min.